In March 1942, the 198 Field Ambulance was acting as an infectious disease hospital located in the small Changi Post Office (right). The need arose for a laboratory service to eliminate the malaria cases from those suffering Bacillary Dysentery. The recently arrived No. 6 Malaria Field laboratory provided this service and this is where I came in with a medical officer of the Indian Medical Service. 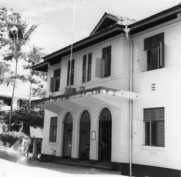 With the dysentery cases increasing the Changi Post Office was abandoned and the service moved to S block of the Roberts Hospital. By the end of March with the incidence of dysentery increasing rapidly it became necessary for the formation of a separate dysentery wing which was established in Block 151, the one now containing the murals. The laboratory established itself in a room, one wall of which became also the chapel wall on the other side of which in mid 1942 Arthur (sic) Warren painted the murals from previously designed cartoons. When the dysentery wing started in March 1942 there was no running water and no sewage system working. Exudates from the dysentery wards had to be carried to fly-proofed Otway pits. Although water was partially restored in 1942 the sewage system remained out of order during the existence of the hospital, March 1942 to September 1943, during which time the Dysentery Wing handled more than eight thousand cases, and the laboratory carried out more than 40,000 microscopic examinations. There were many deaths, and those who recovered soon found themselves on Japanese work parties. All was not plain sailing, just as the Dysentery wing was getting the upper hand of the dysentery epidemic large numbers of Dutch troops from Java and Timor suffering diarrhoea were admitted into the hospital and were a further strain on resources. The chapel came into being about mid 1942., a former Q.M., storeroom before mentioned. It was quite a pleasant and simple affair with a wooden altar and benches and a harmonium against the right hand wall looking from the entrance. A variety of nationalities and denominations made use of the chapel and harmonium but I most clearly remember Len Cheetham of the 198 Field Ambulance who played regularly. The music was a welcome background to our rather tense existence in the laboratory. A new interest was created when Arthur (sic) Warren arrived with his sheaf of cartoons on tracing paper which he carefully transferred to the chapel side of the laboratory wall. I followed the production of the cartoons when ever my work would allow it. To me then it was remarkable how they a life of their own. I am not quite sure but seem to think that he obtained his colours from paint scraped from a variety of scrap, cars ,lorries etc., it seems likely for the paintings were in very low tones then. By June the number of cases in the dysentery wing had dropped considerably, the few remaining cases were dealt with by the main hospital and medical staff were dispersed, some to man medical parties to go and run coolie camps along the line of the Thai Burma railway. The laboratory staff were detailed for this. The Japanese took over the Barrack blocks of Roberts for, they said, their Air Force and the main hospital moved eventually to a site next to the present Kranji Cemetery and suffered anew in attap roofed huts. After the war I returned to Singapore to work and visited the old hospital sites. I found that the Royal Air Force in partial occupation and block 151 housing a small number of National Service recruits, whose beds were strewn about untidily wherever they felt like having them, some in the area that had been the chapel; the wall opposite the murals where the harmonium stood had been removed probably by the Japanese for some reason but the murals were intact apart from the corner of one accidentally damaged (The Crucifixion) when, presumably I suppose, the Japanese had breached that wall to make a doorway which would have come out where the entrance to the laboratory was in those days. The young National Service men when I questioned them had only the vaguest idea about the murals, were unaware that they were in what had been a chapel, and again only the vaguest idea that there had been a hospital and a large body of prisoners of war in the area. The RAF administration it self did not seem to have much knowledge of the history of the area. The young airmen told me an interesting story; they showed me or pointed out one bed space not in the former chapel area, where they said no one would sleep because it was haunted. A number of chaps had tried but all had been frightened by something. I had no explanation. Had it been a space or two on the first floor where I knew some POW died in agony I might have wondered. The barracks generally and what had been the dysentery wing appeared much the same when we had left them. There were square patches of brilliant green grass where once the Otway pits were dug which may have struck visitors as curious, perhaps can even be detected today. They were close by the chapel. Barbed wire still lay about, rusty and broken and bomb damage to the buildings could still be seen. Whether one is a believer or a heathen the murals serve as a very poignant memorial to all those who served and suffered in Singapore. I was a L/Bdr in 1942, and was a patient in the hospital at Roberts Barracks when the murals were first started. I did not know the artist personally, but we all heard that these things were being done under great difficulties. In November 1999 I again visited Thailand (where I worked on the railway with F force) and also Singapore. I visited Roberts Barracks again and saw the remaining Murals in company with my wife and two children. We were all extremely moved and were pleased to hear that they were to be preserved. After so many years of hating, my visits to the cemeteries at Kanchanaburi, Chunkai and Kranji culminating in the sight of these wonderful Murals brought upon me a sense of peace I have not had for a long time. Frank Rups is Dutch by birth, but moved to the Dutch East Indies with his family when he was one year old. He remained there, and on the outbreak of war was called up for military service. His active service consisted of one day of bombing, “I moved from ditch to ditch in the mud. When night came it was over”. Frank was taken prisoner initially being held in the East Indies. Early in 1943, he was taken to Jakarta as part of a working party. Then, a few days later, We were herded cattle into the hold of an old freighter. “We sailed for Singapore which took four days”. In Singapore Frank was put into a camp opposite the Woodlands Camp near Kranji. Frank eventually found himself working on the Japanese airfield construction site at Changi. After a few months, a group of prisoners including Frank were put on a ship in Singapore Harbour. Sailing was delayed And the men on the ship began to be affected by dysentery. The dysentery sufferers were taken off the ship and returned to the Woodlands Camp. On the following day, Frank was transferred to Roberts Barracks and Block 151. “In war or in life everything that happens has a reason. Some are killed or drowned when a ship was torpedoed some are saved and this happened to me”. “When the hospital was moved to Kranji, I moved to Changi jail, but at some point I was used as a exchange with fitter people from Kranji”. There Frank was reunited with a great friend, James Brettall. “By helping one another with bits of extras we survived. Because of my upbringing in Indonesia I knew what weeds to eat. We had some freedom there and I was able to have a fire and cook things. Being amongst the rubber trees there was always some wood to get. We even had a small garden for a while but that did not last There was a Cashew nut tree in the grounds and from the bark of the tree, the hospital made a tannin tea from it that was given to the people that had diarrhoea”.